We have friends in America who absolutely love crepes, pancakes (and everything related) so they keep us informed of anything interesting or amusing they see on TV or in the media over there in the US of A. The latest incident they have reported involves a man from Seattle who managed to cause $500,000 damage after the oil in which he was deep-frying his pancake caught fire. Thankfully no-one was hurt, but he is did cause a lot of damage in his aprtment block – and of course, missed out on the pancakes he was attempting to make. Deep frying pancakes is something we have never tried – and to be frank, we doubt we ever will. Basically, our crepes (or pancakes if you prefer) are pretty good (or maybe even better than that if the comments we regularly hear are to be believed) so we don’t really feel the need to make any major adjustments to our methods. Whenever we come across a way to improve our crepes or our service at weddings, parties or events, then sure, we do it. But experimentation with deep-frying – no thank you. We will leave that to others. That said, the subject of deep-frying pancakes has been mentioned many times before – if fact, just about every time we take our mobile pancake stand to weddings in Scotland. When we get chatting to guests, for some reason the conversation always ends up on the subject of fine Scottish cuisine, and inevitably the deep-fried Mars bar is discussed. 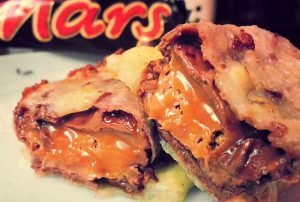 And from talking to wedding guests who live in Scotland, it appears that the deep-fried Mars does in fact exist in real life (though is fairly uncommon) though no-one we have ever talked to has witnessed it as a wedding food in Scotland. Whilst it is still uncommon throughout the country, apparently the Glasgow area is where most outlets for this particular food are found – though we are told Edinburgh does have a few places, largely catering for tourists rather than locals. With mobile chip vans being seen at more weddings nowadays – in Scotland, wedding street food is catching on – perhaps it will one day be seen at a wedding or two. Until that time, crepes as a wedding street food is stylish though less risky and dangerous alternative! Just don’t ask us to deep fry our pancakes.